La Spark – Renault Z.E. 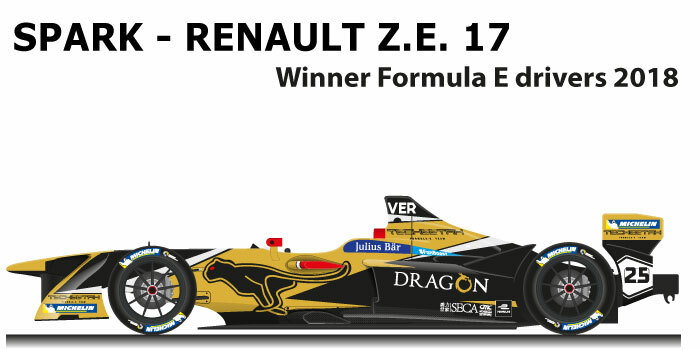 17 n.25 is the car that won the Formula E World Championship in the 2017/2018 season. After a first year of difficulty ending with Vergne’s victory in Montreal, the Chinese Techeetah team confirmed the Renault engine, and joined the French driver Andre Lotterer. Jean-Eric Vergne at the helm of Spark – Renault Z.E. 17 n.25 won the Formula E World Championship in the 2017/2018 season, winning his first drivers’ title. During the season the French rider obtained numerous placings and thanks to the difficulties of the favorite drivers, Di Grassi, Bird and Buemi, he managed to keep the top of the standings for the whole season. Vergne in the season won four races: Santiago de Chile, Punta del Este, Paris and the second race in New York.